Today I am sharing with you a recipe that I posted on Culinary Chat a couple of months ago. Some of you may have noticed that I posted the link originally to my recipe page, but I wanted it to be a permanent fixture to my recipe collection since it’s one of my favorite quick meals. When you’re in a pickle and you’re not sure what to make, this recipe is perfect. It’s quick, healthy and full of flavor. Since I was going for a lighter meal, I decided to leave the recipe the way it is, however, this would be fantastic served with some rice for a complete meal. The sauce to this recipe is so good, it’s salty with just a slight hint of heat from the crushed peppers and garlic. To save on calories I decided to cook the vegetables in chicken broth. 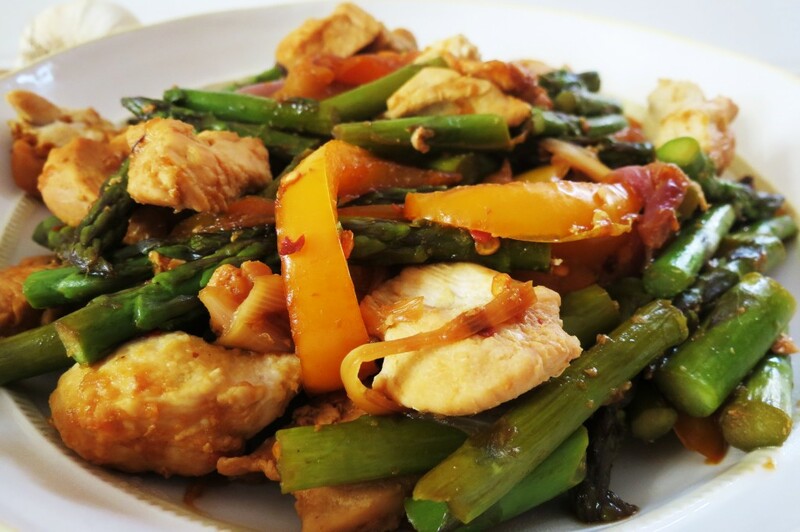 It adds wonderful flavor to the vegetables and chicken, not to mention it makes the chicken juicy! If you don’t have chicken broth, add vegetable broth, that would be good too. Speaking of flavors, having this the next day is even better. The flavors really intensify, so if you decide to make it, make extra! I guarantee you will want this for lunch. 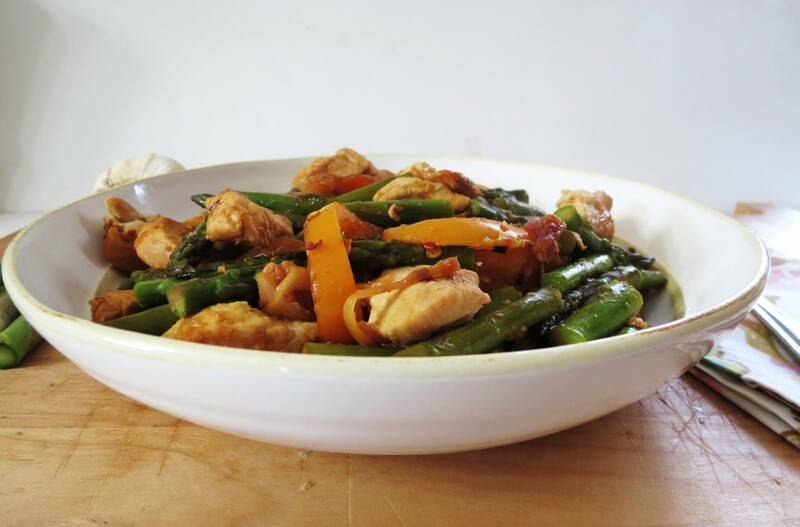 When I made this recipe I used fresh asparagus from the Farmers Market. The key thing to keep in mind when cooking with asparagus is making sure you take off the bitter ends. All you do is hold a spear and snap it. Wherever the piece snaps is where the bitterness ends. My friend Connie told me about that and ever since then I never had a bitter piece of asparagus. Plus I have to admit I love snapping asparagus. It sounds weird, but I do. Add 1 Tbsp. chicken broth in a skillet. Sautée onions and peppers in broth for about 2 minutes over medium-high heat, stirring constantly. Add the garlic, chicken, and continue to sautée for another 3 to 4 minutes, stirring constantly. Add the asparagus, soy sauce, vinegar, and red chili flakes. Stir together and cover. 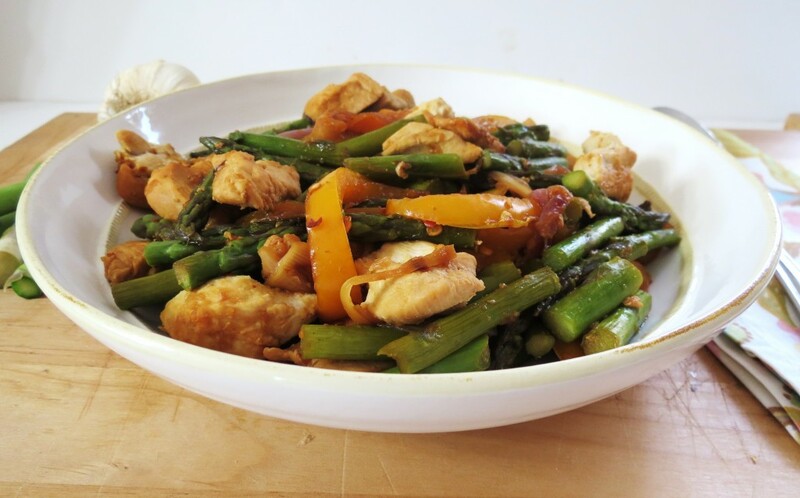 Cook for another 2 to 3 minutes or until asparagus is tender. Sorry for giving a repeat recipe, but this is to good not to share with you. I plan on taking back my recipes from Culinary Chat, so I can be sure I share them with you. I write for Culinary Chat once a month and it’s always a recipe I don’t post here, so stay tuned for some new recipes. Well my Friends, time for me to go. Little Jenny and I are off to spend the day shopping. Have a wonderful weekend. That sauce sounds really tasty and I love how simple it is! Thanks for sharing. Anytime! Have a great weekend Joanne and have fun with The Boy!! Yum! This is my favorite kind of meal!! 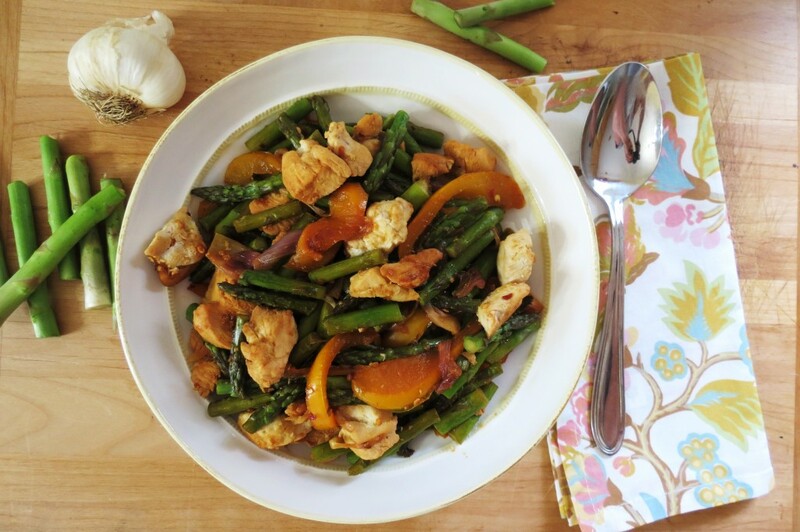 Quick, Easy and full of yummy healthy foods! Thanks for sharing! Thanks, I just shared it on Twitter, Google and StumbleUpon. Have a nice weekend. Ahhh, thank you so much!! You have a nice rest of the weekend! Fabulous Jennifer, just fabulous! Wish I had a bowl right now and I haven’t even had breakfast yet! You always make me laugh! Have a wonderful week, I’m patiently waiting for your cake recipe! That does look yummy, and simple, a winning combination. We are not big on asparagus, but I think this would be good with green, yellow, and red bell peppers. Oh yes all the peppers would be great in this dish!!! Yum! I had some chicken…and NO idea what to do with it. Now this idea looked so delicious!! I just have to get some asparagus yummy! Funny that there are a bazillion chicken recipes out there, yet like you I never have any idea what to do with it! 🙂 Oh if you try it let me know what you think!! Jen, this could easily become a new family favorite! I love everything about this recipe…so yummy and gorgeous!!! Thanks Liz! It makes for a quick night dinner! I was pleasantly surprised at the flavor! Easy lo-cal recipe with ingredients I always have on hand. Thanks for sharing! I am so glad you like it. Such a nice easy meal.